The percentage differential protection or Merz-Price protection based on the circulating current pronciple can also be used for the transformers. This system gives protection against phase to phase faults and phase to ground faults to the power transformers. The principle of such a protection scheme is the comparison of the currents entering and leaving the ends of a transformer. The vector difference of currents passes through the operating coil while the average current passes through the restraining coil. In normal conditions, the two currents at the two ends of the transformer are equal and balance is maintained. So no currents flow through the operating coil of the relay and and relay is inoperative. But when there is phase to phase fault or phase to ground fault, this balance gets disturbed. The difference current flows through the operating coil due to which relay operates, tripping the circuit breaker. 1. In a power transformer, the voltage rating of the two windings is different. The high voltage winding is low current winding while low voltage winding is high current winding. Thus there always exists difference in current on the primary and secondary sides of the power transformer. Hence if C.T.s of same ratio are used on two sides, then relay may get operated through there is no fault existing. To compensate for this difficulty, the current ratios of C.T.s on each side are different. These ratios depend on the line currents of the power transformer and the connection of C.T.s. Due to the different turns ratio, the currents fed into the pilot wires from each end are same under normal conditions so that the relay remains inoperative. For example if K is the turns ratio of a power transformer then the ratio of C.T.s on low voltage side is made K times greater than that of C.T.s on high voltage side. 2. In case of power transformers, there is an inherent phase difference between the voltages induced in high voltage winding and low voltage winding. Due to this, there exists a phase difference between the line currents on primary and secondary sides of a power transformer. This introduces the phase difference between the C.T. secondary currents, on the two sides of a power transformer. Through the turns ratio of C.T.s are selected to compensate for turns ratio of transformer, a differential current may result due to the phase difference between the currents on two sides. Such a different current may operate the relay though there is no fault. Hence it is necessary to correct the phase difference. To compensate for this, the C.T. connections should be such that the resultant currents fed into the pilot wires from either sides are displaced in phase by an angle equal to the phase shift between the primary and secondary currents. To achieve this, secondaries of C.T.s on star connected side of a power transformer are connected in delta while the secondaries of C.T.s on delta connected side of a power transformer are connected in star. The table.1 gives the way of connecting C.T. secondaries for the various types of power transformer connections. With such an arrangement, the phase displacement between the currents gets compensated with the oppositely connected C.T. secondaries. Hence currents fed to the pilot wires from both the sides are in phase under normal running conditions and the relay is ensured to be inoperative. 3. The neutrals of C.T. star and power transformer stars are grounded. 4. Many transformers have tap changing arrangement due to which there is a possibility of flow of differential current. For this, the turns ratio of C.T.s on both sides of the power transformer are provided with tap for of C.T.s on both sides of the power transformer are provided with tap for their adjustment. For the sake of understanding, the connection of C.T. secondaries in delta for star side of power transformer and the connection of C.T. 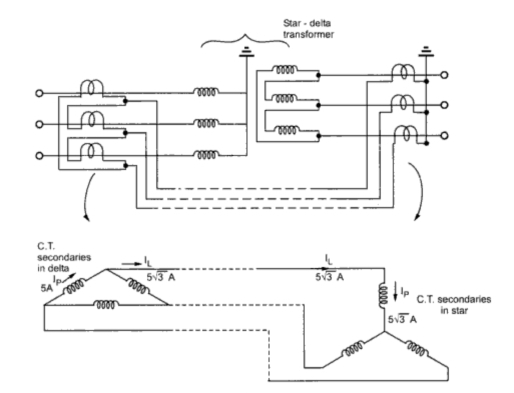 secondaries in star for delta side of power transformer is shown in the Fig.1(a) and (b). 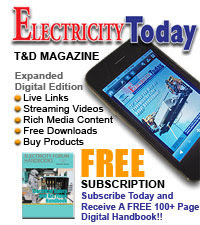 Let us study the Merz-Price protection for the star-delta power transformer. The primary of the power transformer is star connected while the secondary is delta connected. Hence to compensate for the phase difference, the C.T. secondaries on primary side must be connected in delta while the C.T. secondaries on delta side must be connected in star. 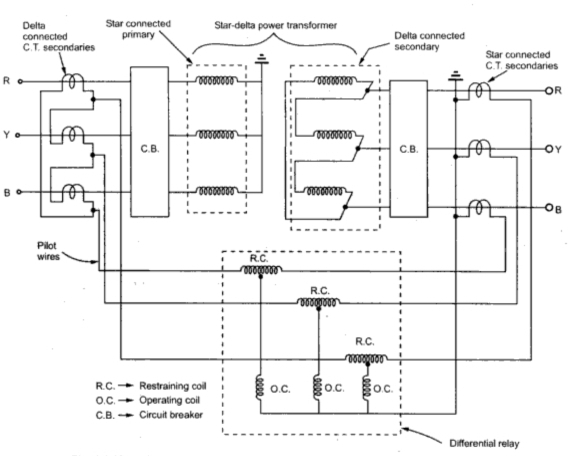 The star point of the power transformer primary as well as the star connected C.T. secondaries must be grounded. The circuit diagram of the scheme is shown in the Fig. 2. The restraining coils are connected across the C.T. secondary windings while the operating coils are connected between the tapping points on the restraining coils and the star point of C.T. secondaries. With the proper selection of turns ratio of C.T.s the coils are under balanced condition during normal operating conditions. The C.T. secondaries carry equal currents which are in phase under normal conditions. So no current flows through the relay and the relay is inoperative. With an internal fault in power transformer windings, the balance in the C.T.s get disturbed. The operating coils of differential relay carry currents proportional to the difference of current between the two sides of a power transformer. This causes the relay operation which trips the main circuit breakers on both the sides of the power transformer. 1. The differential relay must not operate on load or external faults. 2. It must operate on sever internal faults. The relay satisfying these requirements is used in Merz-Price protection. It is important to note that this scheme gives protection against short circuit faults between the turns i.e. interturn faults also. This is because when there is an interturn fault, the turns ratio of power transformer gets affected. 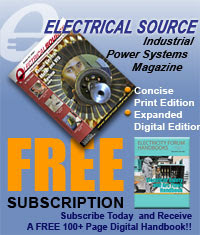 Due to this the currents on both sides of the power transformer become unbalanced. This causes an enough differential current which floes through the relay and the relay operates. The Fig. 3 shows the Merz-Price protection system for the star-star power transformer. 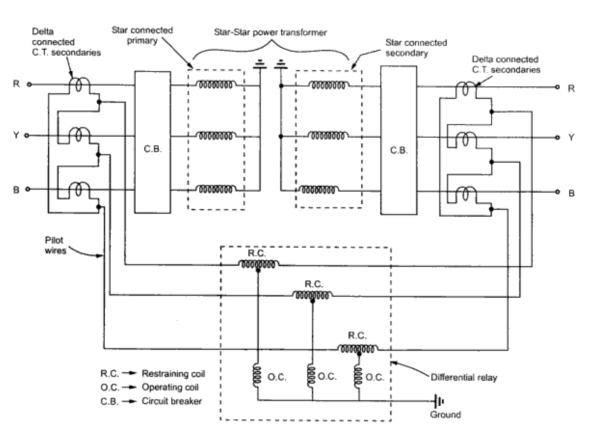 Both primary and secondary of the power transformer are connected in star and hence C.T. secondaries. The operating coils are connected between the tapping on the restraining coil and the ground. The operation of the scheme remains same for any type of power transformer as discussed for star-star power transformer. Example : A three phase power transformer having a line voltage ratio of 400 V to 33 kV is connected in star-delta. the C.T.s on 400 V side have current ratio as 1000/5. What must be the C.T. ratio on 33 kV side. Assume current on 400 V side of transformer to be 1000 A. Solution : The arrangement is shown in the Fig. 4. On the primary side, which is 400 V side of transformer the current is 1000 A. Hence C.T.s primary will carry current of 1000 A. The C.T. ratio is 1000/5 on the primary side hence the current in C.T. This is balance the C.T. secondaries are connected in delta. The same current flows through the star connected C.T. secondaries. Hence each secondaries of C.T. on the secondary side of transformer carries a current of 5√3 A. For the power transformer the apparent power on both sides must be same. Thus each primary of C.T.s connected in star carries a current of 12.12 A.while each secondary of C.T.s connected in star carries a current of 5√3 A. This is the required C.T. ratio on 33 kV side.